A balance sheet reports your assets, liabilities and owner’s equity so that you know exactly what you have, what you owe, and what you’re worth. With ZipBooks you don’t need to have a Masters Degree in accounting to accurately produce a professional-level balance sheet. Create the reports you need without paying an accountant to produce them for you. Your balance sheet tracks assets (things you own that have value), liabilities (amounts you owe to others) and equity (the value of your business). It automatically calculates your retained earnings (profits) based on the end date you choose. 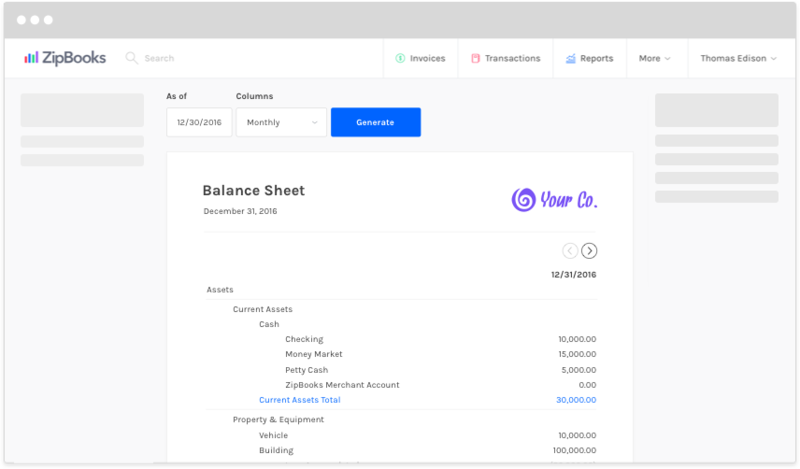 Create balance sheets that reflect any given business year or month, or pull data for the whole life of your business. ZipBooks creates reports from the categories you set up on your chart of accounts. If you haven’t set up any custom accounts, we’ll use the smart default categories that are already set up for you. Intuitive colors will help highlight the important aspects of your report so that it’s easy to follow what’s going on in your business.